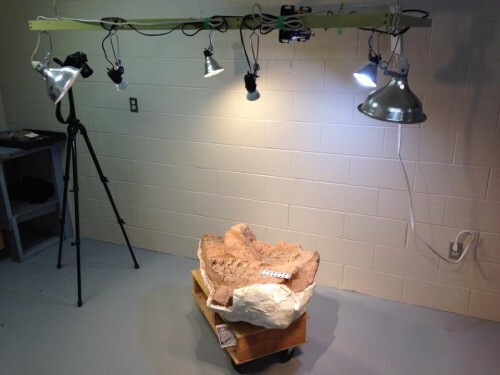 The museum researchers are creating a 3D scan of the block containing the lower leg and foot of one of the Jurassic dinosaurs from Nova Scotia. After repositioning the tibia using a custom-made plaster cradle, the block is being imaged for photogrammatry scanning. Here is a preliminary visual analysis completed with the 3D scan. Post by Fundy Geological Museum. After completing the 3D scan of the foot block, the skull block will be 3D scanned to study how the bones of the skull were displaced when the skeleton was buried. Below is an animation that shows how the skull bones appear to have been displaced just prior or during burial, 200 million years ago. When you visit the Fundy Geological Museum in Parrsboro, Nova Scotia, you have an opportunity to look into the Fossil Research Lab to see the fossils being studied. Real dinosaur bones are also on display in the museum’s gallery. This winter the Fundy Geological Museum is changing some of the displays of the Nova Scotia dinosaur specimens. New specimens will be put on display in April 2015. Follow Earthquake Dinosaurs Facebook page to stay informed about the latest dinosaur research projects. Follow Fundy Geological Museum Facebook page to stay informed about the new exhibits. Questions/Comments – Please leave a comment below.